They still ask: Who killed Deanna? SOMERVILLE — On a chilly March morning in 1995, two young girls taking a shortcut to school in Winter Hill found Deanna Cremin’s body in the parking lot of a senior housing complex on Jaques Street housing complex on Jaques Street. The 17-year-old Somerville High junior had been sexually assaulted and strangled just two-tenths of a mile from her home. On the 18th anniversary of her murder, which remains unsolved, about 400 people on March 30 symbolically walked Cremin the rest of the way home to 48 Jaques St., where she never made it in the early morning hours of March 30, 1995 after leaving her boyfriend’s house at 419 Broadway. 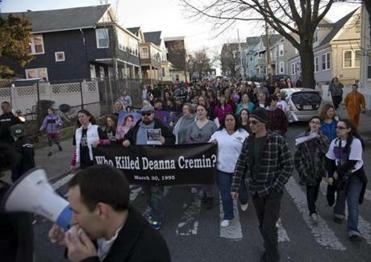 Friends, family, and classmates met in Somerville March 30 to symbolically walk Deanna Cremin home. The gathering was dotted with Cremin’s former classmates and friends, pushing strollers and holding the hands of children, painful reminders of a life she was never able to have. Randi Bevans, 35, was one of Cremin’s closest friends growing up and still thinks about her every day, she said. 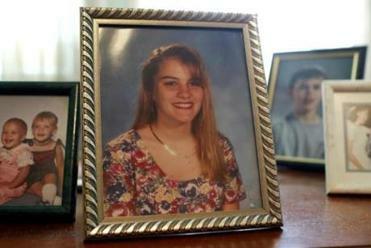 Bevans brought her children, 11 and 14, with her from Southington, Conn.
Two girls walking to elementary school found Deanna Cremin's body behind a senior housing building at 125 Jaques St. at 8 a.m. March 30, 1995. Watch: Video: Who Killed Deanna Cremin? 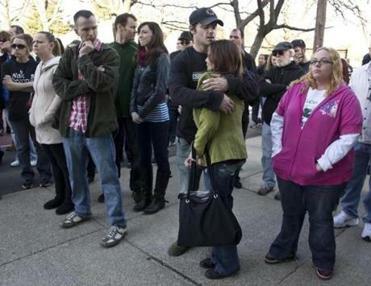 The event seemed like a somber high school reunion. Old friends — some who came from as far as Florida — greeted one another with smiles, but there was a sadness and anger that hovered like a storm cloud. Wendy Cooper, 34 and Sharon Hight, 29, who still live in Somerville, and Lisa O’Leary, 31, now of Medford, grew up with Cremin. All have children now, and they also brought some of them to the walk. A line began to form just before 4 p.m. outside St. Ann’s Church on Thurston Street, waiting for a prayer service to begin. 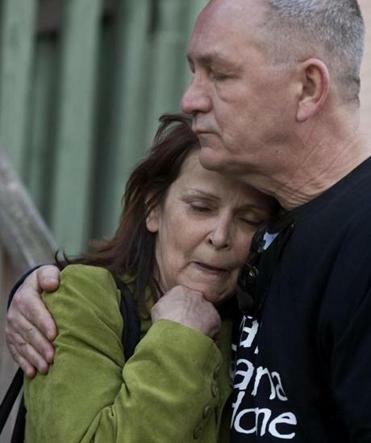 Katherine Cremin, the mother of Deanna Cremin, 17, getting a hug from her son, Mark Cremin at Winter Hill School after she spoke their march called, "Walk Deanna Home." his eyes fall to a photo of his daughter he keeps on his bureau. He picks up the photo and kisses her face. The crowd, many clad in black shirts with a white print that read “Walk Deanna Home,” walked to the Winter Hill Community School yard for a rally, where it swelled as friends, family, and others who have known murder victims spoke to the crowd through a bullhorn. They paused at 419 Broadway, the apartment where Tommy LeBlanc lived. LeBlanc was Cremin’s boyfriend, and they regularly met at each other’s houses to do homework or watch TV, said her mother, Katherine. The night of her death, Cremin called her mother to say she wouldn’t be home by her 10 p.m. curfew because she was watching television at LeBlanc’s house. Katherine Cremin recalls falling asleep on the couch that night, and waking at about midnight. Last week, the crowd walked to the corner of Heath and Bond streets, the location LeBlanc said he accompanied Cremin to before he returned to his apartment, where he told police he was expecting a take-out food order to be delivered. The crowd then moved to 125 Jaques St., where Cremin’s body was found, and paused before walking the rest of the way to her home at 48 Jaques St.
Cremin’s family isn’t alone. There are 134 open investigations of unsolved homicides in Middlesex County, with some dating back to the 1970s, according to a statement from Middlesex District Attorney Gerry Leone’s office. In 2006, then-district attorney Martha Coakley announced that improvements in forensic technology had led to new evidence in Cremin’s case. It was the last public announcement of any developments in finding the killer. Leone’s office declined to discuss any details because the investigation is ongoing. Standing outside her former home, Katherine Cremin, who now lives in Stoneham, recalled the way her family was destroyed. The crowd eventually dissipated, but the pain remains. Katherine Cremin holds onto the hope that the exposure brought by the anniversary of her daughter’s death could lead to information surrounding it. Jarret Bencks can be reached at Bencks.Globe@gmail.com. Christina Jedra can be reached at christina.jedra@globe.com.